This update appears to target users on Android 7.x and below, who will now see Twemoji designs for every emoji. The result? No more missing characters appearing on older systems where new emojis are intended to go. Above: Twitter app for Android 7.1 before (left) and after (right) the switch to Twemoji. One challenge facing Google in recent years is the incredibly slow adoption of new Android releases. 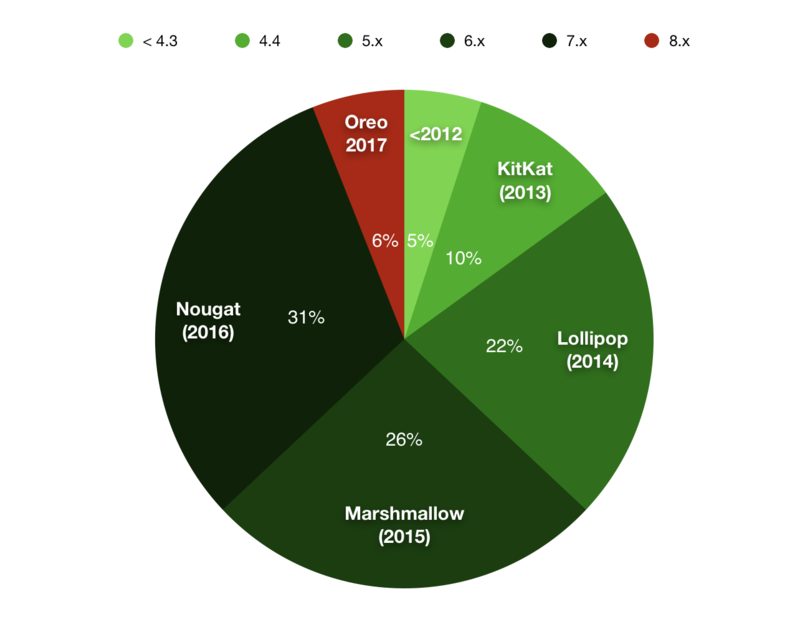 At the time of writing, the Oreo update from 2017 is only installed on 6% of Android devices. Over 1/3 of users are on a version of Android dating back to 2014 or earlier. This fragmentation is nothing new, but lack of new emoji support for years after a release really highlights the issue for users. Above: Only 6% of Android users are using the latest release (Oreo) from 2017. Twitter's switch to using Twemoji on Android will bring the app in line with the emojis seen on Twitter.com (mobile and desktop), as well as TweetDeck. It's worth noting that this emoji implementation has been done using Google's own EmojiCompat library. Created by Google in 2017 to allow apps to support new emojis even on old systems, a key feature is that app developers don't have to use Google's own emojis. In this instance, Twitter is using EmojiCompat to load Twemoji designs for pre-8.x Android users. For example, this tweet previously showed on a Samsung phone missing a number of newer characters, but now shows all emojis (using Twemoji). 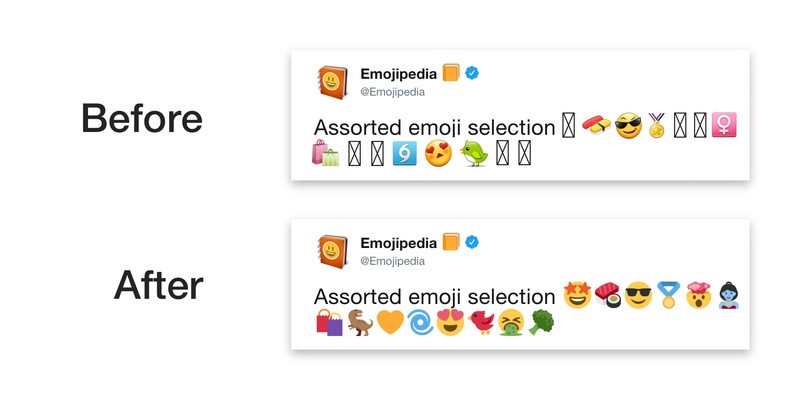 Above: Users no longer see emojis from their device manufacturer in Twitter for Android, but instead see Twemoji designs. Before: Samsung designs / After: Twitter designs. For those stuck on older Android releases this may be a welcome change, particularly as it brings new emoji support to older phones along with the design changes. An option to toggle which emoji set is shown (Twitter, or native) is provided. Above: Users can disable this new feature to stick with the native emoji set. Testing of this feature had been taking place for a subset of users since at least March 2018, and is now supported for users of the official Twitter app using Android 4.4 KitKat — Android 7.1 Nougat. Twitter Design Lead Bryan Haggerty confirmed to Emojipedia that at least 50% of eligible Twitter users should now see this change, with the feature being enabled for more users over the course of this week.